/ Do Lemon Trees Have Thorns? How to Pick Them? 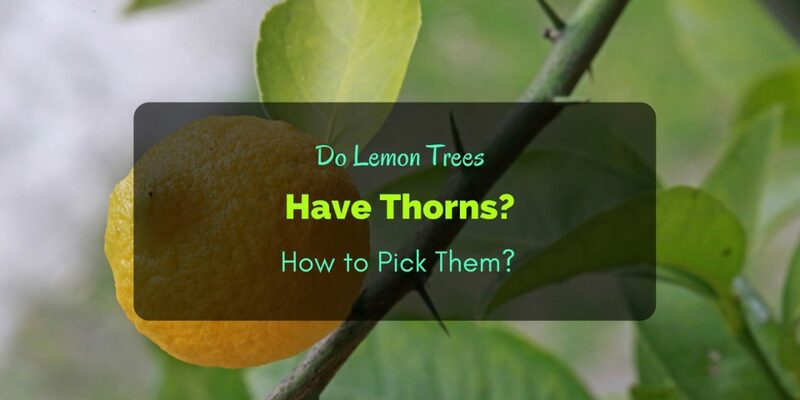 Do Lemon Trees Have Thorns? Belonging to the citrus family, lemon tree is one of the few rare ones that have thorns all over the branches. Somehow, those thorns are helpful adding protection against animals that may want to crawl on the stems and branches then eventually eat leaves. It’s a good thing that lemon fruits are not easily spoiled by insects or animals, unlike apples and berries that get diseases. When a citrus tree becomes older and stronger the thorns diminish over time. Fact: Some of the citrus trees with thorns are oranges, mandarins, grapefruits, pomelos, limes and tangelos. The thorns on a lemon tree are developed at the nodes. In a natural case, they come out with sprouts and fruiting wood. For first timers, those thorns may come as a surprise later. You’d then wonder why do lemon trees have thorns, but now you know. Lemon has a very distinctive scent and flavor, which is why it’s considered as the most acidic citrus fruit. Like most fruits, it has varieties, both thorns and without thorns. Lisbon lemon is a variety that is “thorniest”. Its fruit are produced during fall to early winter. Both ends have longer tips. You also have to check the rootstock on the lemon tree. This can develop thorns. Once spotted, these it must be removed immediately as it can take over the entire tree. It would be more difficult to deal with thorns if that happens. Canopy sprouts also typically grow just above the graft union of the lemon tree. They can also add thorns that should be cut off. Otherwise, a gardener will have to deal with some problems eventually. Now that we’ve learned a basic fact about why do lemon trees have thorns, let’s determine the negative effects. Thorns shouldn’t bother anyone if the spikes don’t cause injury but this can be a little danger to young kids and pets. Thorns can also introduce bacteria into the fruit. If they prick the fruit, any type of bacteria can easily enter and infect it. It is very easy to identify if a lemon fruit has bacteria. It usually causes black spots, which are known as bacterial blast. This is often caused by pseudomonas syringae that loves cool weather as well as wet and windy temperatures. It is totally alright to prune parts of the lemon tree that have thorns. Once the tree is mature, there are fewer thorns. During the growing years that’s when you have to check for thorns and prune whenever necessary. You can easily tell if lemons are ripe. Once they become yellow, their sour juices can be squeezed and consumed instantly. During harvest time, however, this fruit can be picked even while it’s still green. Just allow it to turn yellow or ripe at room temperature. It is best to harvest lemons before they are ripe so they don’t easily overripe. Plus, there’s a tendency that the flavor becomes unpleasant if it has been too long. Other than the color transition, ripe lemon fruits are determined by the size. They grow from 2 to 3 inches long. Also look for the glossy appearance of the fruit. You can gently squeeze to confirm if it’s becoming a little softer. If squishy, then it is overripe. When picking a lemon tree, always look for the thorns. You may need to wear a pair of gloves if you don’t want scratching your palms. In most cases, there’s no need to use shears but bring one just in case. Removing the fruit from the tree is a matter of twisting and pulling. In addition to shears or garden cutters, you may need a ladder. Mature trees can grow very high. A bucket, basket, plastic container or bag where you put all the picked fruits is also needed. Do lemon trees have thorns and are they going to be a problem? Of course not.